For other uses, see Nova Scotia (disambiguation). Nova Scotia (/ˌnoʊvə ˈskoʊʃə/; Latin for "New Scotland"; French: Nouvelle-Écosse; Scottish Gaelic: Alba Nuadh) is one of Canada's three Maritime Provinces, and one of the four provinces that form Atlantic Canada. Its provincial capital is Halifax. 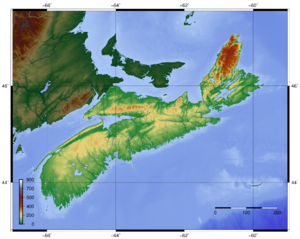 Nova Scotia is the second-smallest of Canada's ten provinces, with an area of 55,284 square kilometres (21,300 sq mi), including Cape Breton and another 3,800 coastal islands. As of 2016, the population was 923,598. 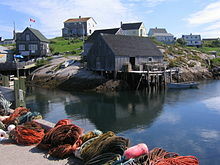 Nova Scotia is Canada's second-most-densely populated province, after Prince Edward Island, with 17.4 inhabitants per square kilometre (45/sq mi). "Nova Scotia" means "New Scotland" in Latin and is the recognized English-language name for the province. In both French and Scottish Gaelic, the province is directly translated as "New Scotland" (French: Nouvelle-Écosse. Gaelic: Alba Nuadh). In general, Romance and Slavic languages use a direct translation of "New Scotland", while most other languages use direct transliterations of the Latin / English name. The province was first named in the 1621 Royal Charter granting to Sir William Alexander in 1632 the right to settle lands including modern Nova Scotia, Cape Breton Island, Prince Edward Island, New Brunswick and the Gaspé Peninsula. Nova Scotia is Canada's smallest province in area after Prince Edward Island. The province's mainland is the Nova Scotia peninsula surrounded by the Atlantic Ocean, including numerous bays and estuaries. Nowhere in Nova Scotia is more than 67 km (42 mi) from the ocean. 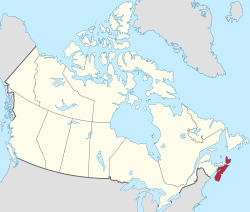 Cape Breton Island, a large island to the northeast of the Nova Scotia mainland, is also part of the province, as is Sable Island, a small island notorious for its shipwrecks, approximately 175 km (110 mi) from the province's southern coast. Nova Scotia has many ancient fossil-bearing rock formations. These formations are particularly rich on the Bay of Fundy's shores. Blue Beach near Hantsport, Joggins Fossil Cliffs, on the Bay of Fundy's shores, has yielded an abundance of Carboniferous-age fossils. Wasson's Bluff, near the town of Parrsboro, has yielded both Triassic- and Jurassic-age fossils. The province contains 5,400 lakes. 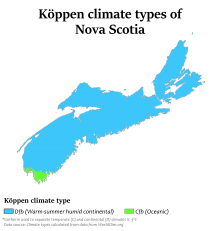 Nova Scotia lies in the mid-temperate zone and, although the province is almost surrounded by water, the climate is closer to continental climate rather than maritime. The winter and summer temperature extremes of the continental climate are moderated by the ocean. However, winters are cold enough to be classified as continental—still being nearer the freezing point than inland areas to the west. The Nova Scotian climate is in many ways similar to the central Baltic Sea coast in Northern Europe, only wetter and snowier. This is true in spite of Nova Scotia's being some fifteen parallels south. Areas not on the Atlantic coast experience warmer summers more typical of inland areas, and winter lows a little colder. Described on the provincial vehicle licence plate as Canada's Ocean Playground, Nova Scotia is surrounded by four major bodies of water: the Gulf of Saint Lawrence to the north, the Bay of Fundy to the west, the Gulf of Maine to the southwest, and Atlantic Ocean to the east. The province includes regions of the Mi'kmaq nation of Mi'kma'ki (mi'gama'gi). The Mi'kmaq people inhabited Nova Scotia at the time the first European colonists arrived. In 1605, French colonists established the first permanent European settlement in the future Canada (and the first north of Florida) at Port Royal, founding what would become known as Acadia. The British conquest of Acadia took place in 1710. The Treaty of Utrecht in 1713 formally recognized this and returned Cape Breton Island (Île Royale) to the French. Present-day New Brunswick then still formed a part of the French colony of Acadia. Immediately after the capture of Port Royal in 1710, Francis Nicholson announced it would be renamed Annapolis Royal in honor of Queen Anne. In 1749, the capital of Nova Scotia moved from Annapolis Royal to the newly established Halifax. In 1755 the vast majority of the French population (the Acadians) was forcibly removed in the Expulsion of the Acadians; New England Planters arrived between 1759 and 1768 to replace them. In 1763, most of Acadia (Cape Breton Island, St. John's Island (now Prince Edward Island), and New Brunswick) became part of Nova Scotia. In 1769, St. John's Island became a separate colony. Nova Scotia included present-day New Brunswick until that province's establishment in 1784, after the arrival of United Empire Loyalists. In 1867, Nova Scotia became one of the four founding provinces of the Canadian Confederation. 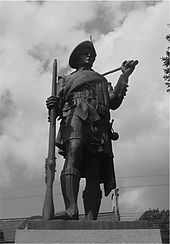 The warfare on Nova Scotian soil during the 17th and 18th centuries significantly influenced the history of Nova Scotia. [need quotation to verify] The Mi'kmaq had lived in Nova Scotia for centuries. The French arrived in 1604, and Catholic Mi'kmaq and Acadians formed the majority of the population of the colony for the next 150 years. During the first 80 years the French and Acadians lived in Nova Scotia, nine significant military clashes took place as the English and Scottish (later British), Dutch and French fought for possession of the area. These encounters happened at Port Royal, Saint John, Cap de Sable (present-day Port La Tour, Nova Scotia), Jemseg (1674 and 1758) and Baleine (1629). The Acadian Civil War took place from 1640 to 1645. The battles during these wars took place primarily Port Royal, Saint John, Canso, Chignecto, Dartmouth (1751), Lunenburg (1756) and Grand-Pré. Despite the British conquest of Acadia in 1710, Nova Scotia remained primarily occupied by Catholic Acadians and Mi'kmaq, who confined British forces to Annapolis and to Canso. The Mi'kmaq signed a series of treaties with Great Britain, beginning after Father Rale's War (1725). In 1725, the British signed a treaty (or "agreement") with the Mi'kmaq, but the authorities[which?] have often disputed its definition of the rights of the Mi'kmaq to hunt and fish on their lands. Monument at Millbrook, near Truro, Nova Scotia paying tribute to Glooscap--a legendary figure to Mi'kmaq people of Nova Scotia. A generation later, Father Le Loutre's War began when Edward Cornwallis arrived to establish Halifax with 13 transports on June 21, 1749. A General Court, made up of the governor and the Council, was the highest court in the colony at the time. Jonathan Belcher was sworn in as chief justice of the Nova Scotia Supreme Court on October 21, 1754. The first legislative assembly in Halifax, under the Governorship of Charles Lawrence, met on October 2, 1758. During the French and Indian War of 1754–63 (the North American theatre of the Seven Years' War of 1756-1763), the British deported the Acadians and recruited New England Planters to resettle the colony. The 75-year period of war ended with the Halifax Treaties between the British and the Mi'kmaq (1761). After the war, some Acadians were allowed to return and the British made treaties with the Mi’kmaq. 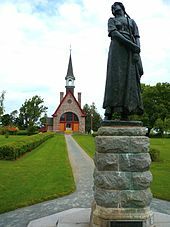 This church at Grand Pre, Nova Scotia, commemorates the beginning of the Acadian expulsion where the men were gathered to hear their fate from the British in 1755. The American Revolution (1775–1783) had a significant impact on shaping Nova Scotia. Initially, Nova Scotia—"the 14th American Colony" as some called it—displayed ambivalence over whether the colony should join the more southern colonies in their defiance of Britain, and rebellion flared at the Battle of Fort Cumberland (1776) and at the Siege of Saint John (1777). Throughout the war, American privateers devastated the maritime economy by capturing ships and looting almost every community outside of Halifax. These American raids alienated many sympathetic or neutral Nova Scotians into supporting the British. By the end of the war Nova Scotia had outfitted a number of privateers to attack American shipping. British military forces based at Halifax succeeded in preventing American support for rebels in Nova Scotia and deterred any invasion of Nova Scotia. However the British navy failed to establish naval supremacy. While the British captured many American privateers in battles such as the Naval battle off Halifax (1782), many more continued attacks on shipping and settlements until the final months of the war. The Royal Navy struggled to maintain British supply lines, defending convoys from American and French attacks as in the fiercely fought convoy battle, the Naval battle off Cape Breton (1781). An interpretive sign along the Heritage Trail at the Black Loyalist Heritage Society's Birchtown museum. After the Thirteen Colonies and their French allies forced the British forces to surrender (1781), approximately 33,000 Loyalists (the King's Loyal Americans, allowed to place "United Empire Loyalist" after their names) settled in Nova Scotia (14,000 of them in what became New Brunswick) on lands granted by the Crown as some compensation for their losses. (The British administration divided Nova Scotia and hived off Cape Breton and New Brunswick in 1784). The Loyalist exodus created new communities across Nova Scotia, including Shelburne, which briefly became one of the larger British settlements in North America, and infused Nova Scotia with additional capital and skills. However the migration also caused political tensions between Loyalist leaders and the leaders of the existing New England Planters settlement. The Loyalist influx also pushed Nova Scotia's 2000 Mi'kmaq People to the margins as Loyalist land grants encroached on ill-defined native lands. As part of the Loyalist migration, about 3,000 Black Loyalists arrived; they founded the largest free Black settlement in North America at Birchtown, near Shelburne. Many Nova Scotian communities were settled by British regiments that fought in the war. During the War of 1812, Nova Scotia's contribution to the British war effort involved communities either purchasing or building various privateer ships to attack U.S. vessels. Perhaps the most dramatic moment in the war for Nova Scotia occurred when HMS Shannon escorted the captured American frigate USS Chesapeake into Halifax Harbour (1813). Many of the U.S. prisoners were kept at Deadman's Island, Halifax. During this century, Nova Scotia became the first colony in British North America and in the British Empire to achieve responsible government in January–February 1848 and become self-governing through the efforts of Joseph Howe. Nova Scotia had established representative government in 1758, an achievement later commemorated by the erection of the Dingle Tower in 1908. Nova Scotians fought in the Crimean War of 1853–1856. 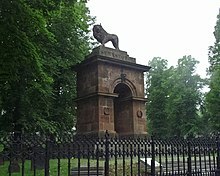 The Welsford-Parker Monument in Halifax is the second-oldest war monument in Canada (1860) and the only Crimean War monument in North America. It commemorates the 1854–55 Siege of Sevastopol. Thousands of Nova Scotians fought in the American Civil War (1861–1865), primarily on behalf of the North. The British Empire (including Nova Scotia) declared itself neutral in the conflict. As a result, Britain (and Nova Scotia) continued to trade with both the South and the North. Nova Scotia's economy boomed during the Civil War. Soon after the American Civil War, Pro-Canadian Confederation premier Charles Tupper led Nova Scotia into the Canadian Confederation on July 1, 1867, along with New Brunswick and the Province of Canada. The Anti-Confederation Party was led by Joseph Howe. Almost three months later, in the election of September 18, 1867, the Anti-Confederation Party won 18 out of 19 federal seats, and 36 out of 38 seats in the provincial legislature. Nova Scotia became a world leader in both building and owning wooden sailing ships in the second half of the 19th century. Nova Scotia produced internationally recognized shipbuilders Donald McKay and William Dawson Lawrence. The fame Nova Scotia achieved from sailors was assured when Joshua Slocum became the first man to sail single-handedly around the world (1895). International attention continued into the following century with the many racing victories of the Bluenose schooner. Nova Scotia was also the birthplace and home of Samuel Cunard, a British shipping magnate (born at Halifax, Nova Scotia) who founded the Cunard Line. a county boundaries contiguous with those of the Cape Breton Regional Municipality. b county boundaries contiguous with those of the Halifax Regional Municipality. c county boundaries contiguous with those of the Region of Queens Municipality. According to the 2006 Canadian census the largest ethnic group in Nova Scotia is Scottish (31.9%), followed by English (31.8%), Irish (21.6%), French (17.9%), German (11.3%), Aboriginal origin (5.3%), Dutch (4.1%), Black Canadians (2.8%), Welsh (1.9%) Italian (1.5%), and Scandinavian (1.4%). 40.9% of respondents identified their ethnicity as "Canadian". Nova Scotia has a long history of social justice work to address issues such as racism and sexism within its borders. The Nova Scotia legislature was the third in Canada to pass human rights legislation (1963). The Nova Scotia Human Rights Commission was established in 1967. Figures shown are for the number of single-language responses and the percentage of total single-language responses. Nova Scotia is home to the largest Scottish Gaelic-speaking community outside of Scotland, with a small number of native speakers in Pictou County, Antigonish County, and Cape Breton Island, and the language is taught in a number of secondary schools throughout the province. In 2018 the government launched a new Gaelic vehicle license plate to raise awareness of the language and help fund Gaelic language and culture initiatives. They estimated that there were 2,000 Gaelic speakers in the province. In 1871, the largest religious denominations were Protestant with 103,500 (27%); Roman Catholic with 102,000 (26%); Baptist with 73,295 (19%); Anglican with 55,124 (14%); Methodist with 40,748 (10%), Lutheran with 4,958 (1.3%); and Congregationalist with 2,538 (0.65%). According to the 2001 census, the largest denominations by number of adherents were the Roman Catholic Church with 327,940 (37%); the United Church of Canada with 142,520 (17%); and the Anglican Church of Canada with 120,315 (13%).There are also 8,505 (0.9%) Muslims according to 2011 census. Lobster fishing boats in Yarmouth, Nova Scotia. Nova Scotia's per capita GDP in 2010 was $38,475, significantly lower than the national average per capita GDP of $47,605 and a little more than half of Canada's richest province, Alberta. GDP growth has lagged behind the rest of the country for at least the past decade. Nova Scotia's traditionally resource-based economy has diversified in recent decades. The rise of Nova Scotia as a viable jurisdiction in North America, historically, was driven by the ready availability of natural resources, especially the fish stocks off the Scotian Shelf. The fishery was a pillar of the economy since its development as part of New France in the 17th century; however, the fishery suffered a sharp decline due to overfishing in the late 20th century. The collapse of the cod stocks and the closure of this sector resulted in a loss of approximately 20,000 jobs in 1992. Other sectors in the province were also hit hard, particularly during the last two decades: coal mining in Cape Breton and northern mainland Nova Scotia has virtually ceased, and a large steel mill in Sydney closed during the 1990s. More recently, the high value of the Canadian dollar relative to the US dollar has hurt the forestry industry, leading to the shutdown of a long-running pulp and paper mill near Liverpool. Mining, especially of gypsum and salt and to a lesser extent silica, peat and barite, is also a significant sector. Since 1991, offshore oil and gas has become an important part of the economy, although production and revenue are now declining. Agriculture remains an important sector in the province, particularly in the Annapolis Valley. Nova Scotia’s defence and aerospace sector generates approximately $500 million in revenues and contributes about $1.5 billion to the provincial economy each year. To date, 40% of Canada’s military assets reside in Nova Scotia. Nova Scotia has the fourth-largest film industry in Canada hosting over 100 productions yearly, more than half of which are the products of international film and television producers. In 2015, the government of Nova Scotia eliminated tax credits to film production in the province, jeopardizing the industry given most other jurisdictions continue to offer such credits. The Nova Scotia tourism industry includes more than 6,500 direct businesses, supporting nearly 40,000 jobs. Two hundred thousand cruise-ship passengers from around the world flow through the Port of Halifax, Nova Scotia each year. This industry contributes approximately $1.3 billion annually to the economy. The province also boasts a rapidly developing Information & Communication Technology (ICT) sector which consists of over 500 companies, and employs roughly 15,000 people. In 2006, the manufacturing sector brought in over $2.6 billion in chained GDP, the largest output of any industrial sector in Nova Scotia. Michelin remains by far the largest single employer in this sector, operating three production plants in the province. As of 2012, the median family income in Nova Scotia was $67,910, below the national average of $74,540; in Halifax the figure rises to $80,490. The fishing boats are completely aground at low tide along the rich fishing grounds of Fundy Bay, at Hall's Harbour, Nova Scotia. The province is the world’s largest exporter of Christmas trees, lobster, gypsum, and wild berries. Its export value of fish exceeds $1 billion, and fish products are received by 90 countries around the world. Nevertheless, the province's imports far exceed its exports. While these numbers were roughly equal from 1992 until 2004, since that time the trade deficit has ballooned. In 2012, exports from Nova Scotia were 12.1% of provincial GDP, while imports were 22.6%. Nova Scotia is ordered by a parliamentary government within the construct of constitutional monarchy; the monarchy in Nova Scotia is the foundation of the executive, legislative, and judicial branches. The sovereign is Queen Elizabeth II, who also serves as head of state of 15 other Commonwealth countries, each of Canada's nine other provinces, and the Canadian federal realm, and resides predominantly in the United Kingdom. As such, the Queen's representative, the Lieutenant Governor of Nova Scotia (at present Arthur Joseph LeBlanc), carries out most of the royal duties in Nova Scotia. In 1937, Everett Farmer was the last person hanged (for murder) in Nova Scotia. The direct participation of the royal and viceroyal figures in any of these areas of governance is limited, though; in practice, their use of the executive powers is directed by the Executive Council, a committee of ministers of the Crown responsible to the unicameral, elected House of Assembly and chosen and headed by the Premier of Nova Scotia (presently Stephen McNeil), the head of government. To ensure the stability of government, the lieutenant governor will usually appoint as premier the person who is the current leader of the political party that can obtain the confidence of a plurality in the House of Assembly. The leader of the party with the second-most seats usually becomes the Leader of Her Majesty's Loyal Opposition (presently Tim Houston) and is part of an adversarial parliamentary system intended to keep the government in check. Each of the 51 Members of the Legislative Assembly in the House of Assembly is elected by single member plurality in an electoral district or riding. General elections must be called by the lieutenant governor on the advice of the premier, or may be triggered by the government losing a confidence vote in the House. There are three dominant political parties in Nova Scotia: the Liberal Party, the New Democratic Party, and the Progressive Conservative Party. The other two registered parties are the Green Party of Nova Scotia and the Atlantica Party, neither of which has a seat in the House of Assembly. The province's revenue comes mainly from the taxation of personal and corporate income, although taxes on tobacco and alcohol, its stake in the Atlantic Lottery Corporation, and oil and gas royalties are also significant. In 2006–07, the province passed a budget of $6.9 billion, with a projected $72 million surplus. Federal equalization payments account for $1.385 billion, or 20.07% of the provincial revenue. The province participates in the HST, a blended sales tax collected by the federal government using the GST tax system. Nova Scotia no longer has any incorporated cities; they were amalgamated into Regional Municipalities in 1996. Nova Scotia has long been a centre for artistic and cultural excellence. The capital, Halifax, hosts institutions such as Nova Scotia College of Art and Design University, Art Gallery of Nova Scotia, Neptune Theatre, Dalhousie Arts Centre, Two Planks and a Passion Theatre, Ship's Company Theatre and the Symphony Nova Scotia. The province is home to avant-garde visual art and traditional crafting, writing and publishing and a film industry. Much of the historic public art sculptures in the province were made by New York sculptor J. Massey Rhind as well as Canadian sculptors Hamilton MacCarthy, George Hill, Emanuel Hahn and Louis-Philippe Hébert. Some of this public art was also created by Nova Scotian John Wilson (sculptor). Nova Scotian George Lang was a stone sculptor who also built many landmark buildings in the province, including the Welsford-Parker Monument. 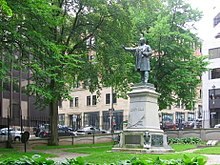 Two valuable sculptures/ monuments in the province are in St. Paul's Church (Halifax): one by John Gibson (for Richard John Uniacke, Jr.) and another monument by Sir Francis Leggatt Chantrey (for Amelia Ann Smyth). Both Gibson and Chantry were famous British sculptors during the Victorian era and have numerous sculptures in the Tate, Museum of Fine Arts, Boston and Westminster Abbey. Some of the province's greatest painters were William Valentine, Maria Morris, Jack L. Gray, Mabel Killiam Day, Ernest Lawson, Frances Bannerman, Alex Colville, Tom Forrestall and ship portrait artist John O'Brien. Some of most notable artists whose works have been acquired by Nova Scotia are British artist Joshua Reynolds (collection of Art Gallery of Nova Scotia); William Gush and William J. Weaver (both have works in Province House); Robert Field (Government House), as well as leading American artists Benjamin West (self portrait in The Halifax Club, portrait of chief justice in Nova Scotia Supreme Court), John Singleton Copley, Robert Feke, and Robert Field (the latter three have works in the Uniacke Estate). Two famous Nova Scotian photographers are Wallace R. MacAskill and Sherman Hines. Three of the most accomplished illustrators were George Wylie Hutchinson, Bob Chambers (cartoonist) and Donald A. Mackay. Renowned American artists like sculptor Richard Serra, composer Philip Glass and abstract painter John Beardman spent part of the year in Nova Scotia. Nova Scotia has produced numerous film actors. Academy Award nominee Ellen Page (Juno, Inception) was born in Halifax, Nova Scotia; five-time Academy Award nominee Arthur Kennedy (Lawrence of Arabia, High Sierra) called Nova Scotia his home; and two time Golden Globe winner Donald Sutherland (MASH, Ordinary People) spent most of his youth in the province. Other actors include John Paul Tremblay, Robb Wells, Mike Smith and John Dunsworth of Trailer Park Boys and actress Joanne Kelly of Warehouse 13. Nova Scotia has also produced numerous film directors such as Thom Fitzgerald (The Hanging Garden), Daniel Petrie (Resurrection—Academy Award nominee) and Acadian film director Phil Comeau's multiple award-winning local story (Le secret de Jérôme). Nova Scotian stories are the subject of numerous feature films: Margaret's Museum (starring Helena Bonham Carter); The Bay Boy (directed by Daniel Petrie and starring Kiefer Sutherland); New Waterford Girl; The Story of Adele H. (the story of unrequited love of Adèle Hugo); and two films of Evangeline (one starring Miriam Cooper and another starring Dolores del Río). There is a significant film industry in Nova Scotia. Feature filmmaking began in Canada with Evangeline (1913), made by Canadian Bioscope Company in Halifax, which released six films before it closed. The film has since been lost. Some of the award-winning feature films made in the province are Titanic (starring Leonardo DiCaprio and Kate Winslet); The Shipping News (starring Kevin Spacey and Julianne Moore); K-19: The Widowmaker (starring Harrison Ford and Liam Neeson) and Amelia (starring Hilary Swank, Richard Gere and Ewan McGregor). Nova Scotia has also produced numerous television series: This Hour Has 22 Minutes, Don Messer's Jubilee, Black Harbour, Haven, Trailer Park Boys, Mr. D, Call Me Fitz, and Theodore Tugboat. The Jesse Stone film series on CBS starring Tom Selleck is also routinely produced in the province. There are numerous Nova Scotian authors who have achieved international fame: Thomas Chandler Haliburton (The Clockmaker); Alistair MacLeod (No Great Mischief); Margaret Marshall Saunders (Beautiful Joe), Laurence B. Dakin (Marco Polo), and Joshua Slocum (Sailing Alone Around the World). Other authors include Johanna Skibsrud (The Sentimentalists), Alden Nowlan (Bread, Wine and Salt), George Elliott Clarke (Execution Poems), Lesley Choyce (Nova Scotia: Shaped by the Sea), Thomas Raddall (Halifax: Warden of the North), Donna Morrissey (Kit's Law), Frank Parker Day (Rockbound). Nova Scotia has also been the subject of numerous literary books. Some of the international best-sellers are: Last Man Out: The Story of the Springhill Mining Disaster (by Melissa Fay Greene) ; Curse of the Narrows: The Halifax Explosion 1917 (by Laura MacDonald); "In the Village" (short story by Pulitzer Prize–winning author Elizabeth Bishop); and National Book Critics Circle Award winner Rough Crossings (by Simon Schama). Other authors who have written novels about Nova Scotian stories include: Linden MacIntyre (The Bishop's Man); Hugh MacLennan (Barometer Rising); Rebecca McNutt (Mandy and Alecto); Ernest Buckler (The Valley and the Mountain); Archibald MacMechan (Red Snow on Grand Pré), Henry Wadsworth Longfellow (long poem Evangeline); Lawrence Hill (The Book of Negroes) and John Mack Faragher (Great and Nobel Scheme). Nova Scotia has produced numerous musicians. The Grammy Award winners include Denny Doherty (from The Mamas & the Papas), Anne Murray, and Sarah McLachlan. Other musicians include country singer Hank Snow, country singer George Canyon, jazz singer Holly Cole, opera singers Portia White and Barbara Hannigan, multi-Juno Award nominated rapper Classified, Rita MacNeil, Matt Mays, Sloan, Feist, Todd Fancey, The Rankin Family, April Wine, Buck 65, Joel Plaskett, Grand Dérangement, and country music singer Drake Jensen. There are numerous songs written about Nova Scotia: The Ballad of Springhill (written by Peggy Seeger and performed by Irish folk singer Luke Kelly a member of The Dubliners, U2); numerous songs by Stan Rogers including Bluenose, The Jeannie C (mentions Little Dover, NS), Barrett's Privateers, Giant, and The Rawdon Hills; Farewell to Nova Scotia (traditional); Blue Nose (Stompin' Tom Connors); She's Called Nova Scotia (by Rita MacNeil); Cape Breton (by David Myles); Acadian Driftwood (by Robbie Robertson); Acadie (by Daniel Lanois); and My Nova Scotia Home (by Hank Snow). Nova Scotia has also produced some significant songwriters such as Grammy Award winning Gordie Sampson. Sampson has written songs for Carrie Underwood ("Jesus, Take the Wheel", "Just a Dream", "Get Out of This Town"), Martina McBride ("If I Had Your Name", "You're Not Leavin Me"), LeAnn Rimes ("Long Night", "Save Myself"), and George Canyon ("My Name"). Another successful Nova Scotia songwriter was Hank Snow whose songs have been recorded by The Rolling Stones, Elvis Presley, and Johnny Cash. Music producer Brian Ahern is a Nova Scotian. He got his start by being music director for CBC television's Singalong Jubilee. He later produced 12 albums for Anne Murray ("Snowbird", "Danny’s Song” and "You Won't See Me"); 11 albums for Emmylou Harris (whom he married at his home in Halifax on January 9, 1977). He also produced discs for Johnny Cash, George Jones, Roy Orbison, Glen Campbell, Don Williams, Jesse Winchester and Linda Ronstadt. Another noted writer is Cape Bretoner Leon Dubinsky, who wrote the anthem, "Rise Again", among many other songs performed by various Canadian artists. Sport is an important part of Nova Scotia culture. There are numerous semi pro, university and amateur sports teams, for example, The Halifax Mooseheads, 2013 Canadian Hockey League Memorial Cup Champions, and the Cape Breton Screaming Eagles, both of the Quebec Major Junior Hockey League. The Halifax Hurricanes of the National Basketball League of Canada is another team that calls Nova Scotia home, and were 2016 league champions. The Nova Scotia Open is a professional golf tournament on the Web.com Tour since 2014. The province has also produced numerous athletes such as Sidney Crosby (ice hockey), Nathan Mackinnon (ice hockey), Brad Marchand (ice hockey), Colleen Jones (curling), Al MacInnis (ice hockey), TJ Grant (mixed martial arts), Rocky Johnson (wrestling, and father of Dwayne "The Rock" Johnson), George Dixon (boxing) and Kirk Johnson (boxing). The achievements of Nova Scotian athletes are presented at the Nova Scotia Sport Hall of Fame. The cuisine of Nova Scotia is typically Canadian with an emphasis on local seafood. One endemic dish (in the sense of "peculiar to" and "originating from") is the Halifax donair, a distant variant of the doner kebab prepared using thinly sliced beef meatloaf and a sweet condensed milk sauce. As well, hodge podge, a creamy soup of fresh baby vegetables, is native to Nova Scotia. The province is also known for blueberry grunt. Nova Scotia's tourism industry showcases Nova Scotia's culture, scenery and coastline. Nova Scotia has many museums reflecting its ethnic heritage, including the Glooscap Heritage Centre, Grand-Pré National Historic Site, Hector Heritage Quay and the Black Cultural Centre for Nova Scotia. Other museums tell the story of its working history, such as the Cape Breton Miners' Museum, and the Maritime Museum of the Atlantic. Nova Scotia is home to several internationally renowned musicians and there are visitor centres in the home towns of Hank Snow, Rita MacNeil, and Anne Murray Centre. There are also numerous music and cultural festivals such as the Stan Rogers Folk Festival, Celtic Colours, the Nova Scotia Gaelic Mod, Royal Nova Scotia International Tattoo, the Atlantic Film Festival and the Atlantic Fringe Festival. The province has 87 National Historic Sites of Canada, including the Habitation at Port-Royal, the Fortress of Louisbourg and Citadel Hill (Fort George) in Halifax. Nova Scotia has two national parks, Kejimkujik and Cape Breton Highlands, and many other protected areas. The Bay of Fundy has the highest tidal range in the world, and the iconic Peggys Cove is internationally recognized and receives 600,000-plus visitors a year. Acadian Skies and Mi'kmaq Lands is a starlight reserve in southwestern Nova Scotia. It is the first certified UNESCO-Starlight Tourist Destination. Starlight tourist destinations are locations that offer conditions for observations of stars which are protected from light pollution. Cruise ships pay regular visits to the province. In 2010, Halifax received 261,000 passengers and Sydney 69,000. A 2008 Nova Scotia tourism campaign included advertising a fictional mobile phone called Pomegranate and establishing website, which after reading about "new phone" redirected to tourism info about region. The Minister of Education is responsible for the administration and delivery of education, as defined by the Education Act and other acts relating to colleges, universities and private schools. The powers of the Minister and the Department of Education are defined by the Ministerial regulations and constrained by the Governor-In-Council regulations. Nova Scotia has more than 450 public schools for children. The public system offers primary to Grade 12. There are also private schools in the province. Public education is administered by seven regional school boards, responsible primarily for English instruction and French immersion, and also province-wide by the Conseil Scolaire Acadien Provincial, which administers French instruction to students for whom the primary language is French. The Nova Scotia Community College system has 13 campuses around the province. The community college, with its focus on training and education, was established in 1988 by amalgamating the province's former vocational schools. In addition to its community college system the province has 10 universities, including Dalhousie University, University of King's College, Saint Mary's University, Mount Saint Vincent University, NSCAD University, Acadia University, Université Sainte-Anne, Saint Francis Xavier University, Cape Breton University and the Atlantic School of Theology. There are also more than 90 registered private commercial colleges in Nova Scotia. ^ a b "Population and dwelling counts, for Canada, provinces and territories, 2016 census". Statcan.gc.ca. February 8, 2017. Retrieved February 8, 2017. ^ "Population and dwelling counts, for Canada, provinces and territories, 2011 and 2006 censuses". Statcan.gc.ca. January 24, 2012. Retrieved April 3, 2012. ^ "The Legal Context of Canada's Official Languages". University of Ottawa. Retrieved March 7, 2019. ^ "Gross domestic product, expenditure-based, by province and territory (2013)". Statistics Canada. November 5, 2014. Retrieved October 11, 2015. ^ Scottish Settlement. Novascotia.com. Retrieved on July 12, 2013. ^ Nova Scotia: The Royal Charter of 1621 to Sir William Alexander. Toronto: University of Toronto Press (Reprinted from the Transactions of the Royal Canadian Institute, Vol. XIV, Part 1). 1922. ^ Harrison, Ted (1993). O Canada. Ticknor & Fields. ^ Maritime Museum of the Atlantic Sable Island Lifesaving and Ship Wrecks Info Sheet Archived October 31, 2012, at the Wayback Machine. Museum.gov.ns.ca (July 27, 1999). Retrieved on 2013-07-12. ^ "Gaspe, Canada". Princess Explorations Café (Powered by the New York Times). 2016. ^ a b "The Climate of Nova Scotia". The Climates of Canada. Environment Canada. Archived from the original on April 19, 2010. Retrieved June 7, 2015. ^ "National Climate Data and Information Archive". Environment Canada. October 31, 2011. Retrieved October 24, 2015. ^ The territory of the Nation of Mi'kma'ki also includes the Maritimes, parts of Maine, Newfoundland and the Gaspé Peninsula. ^ Info Sheet – The Mi'kmaq Archived November 21, 2012, at the Wayback Machine. Museum.gov.ns.ca. Retrieved on July 12, 2013. ^ Morton, Desmond (November 30, 1999). Canada: A Millennium Portrait. Dundurn. p. 19. ISBN 978-1-4597-1085-6. ^ Nova Scotia Archives – An Acadian Parish Remembered Archived January 16, 2013, at the Wayback Machine. Gov.ns.ca (December 1, 2009). Retrieved on 2013-07-12. ^ In 1765, the county of Sunbury was created. This included the territory of present-day New Brunswick and eastern Maine as far as the Penobscot River. ^ The other provinces were New Brunswick and the Province of Canada (which became the separate provinces of Quebec and Ontario). 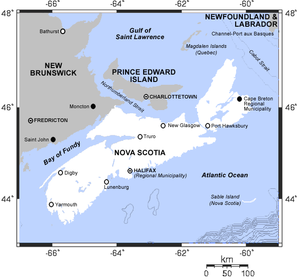 ^ Until 1784, New Brunswick administratively formed part of Nova Scotia. ^ Statutes at Large of Nova Scotia, Volume 1, 1758–1804. ^ Roger Marsters (2004). Bold Privateers: Terror, Plunder and Profit on Canada's Atlantic Coast, pp. 87–89. ^ Paul R. Magocsi; Multicultural History Society of Ontario (1999). Encyclopedia of Canada's Peoples. University of Toronto Press. p. 165. ISBN 978-0-8020-2938-6. ^ Marquis, Greg. In Armageddon's Shadow: The Civil War and Canada's Maritime Provinces. McGill-Queen's University Press. 1998. ^ "Nova Scotia—Canada's population clock". Statcan.gc.ca. November 18, 2010. Archived from the original on August 17, 2011. Retrieved August 29, 2011. ^ "History of County Boundaries". Province of Nova Scotia: Department of Municipal Affairs. October 8, 2015. Retrieved December 27, 2016. ^ Foster Stockwell (2004). A Sourcebook for Genealogical Research: Resources Alphabetically by Type and Location. McFarland & Company, Inc., Publishers. p. 205. ISBN 9780786484386. Retrieved December 29, 2016. ^ a b c d e "Population and dwelling count highlight tables, 2016 Census". Statistics Canada. February 8, 2017. Retrieved February 8, 2017. ^ Statistics Canada (January 2005). "Population by selected ethnic origins, by province and territory (2006 Census) (Nova Scotia)". Retrieved July 9, 2015. ^ Bridglal Pachai, (Ed). Nova Scotia Human Rights Commission: 25th Anniversary: A History 1967–1992. 1992. ^ "Nova Scotia unveils Gaelic licence plate, as it seeks to expand language". Atlantic CTV News. Bell Media. THE CANADIAN PRESS. May 1, 2018. Retrieved May 2, 2018. ^ "Religions in Canada". 2.statcan.ca. Retrieved October 6, 2010. ^ Fish in Crisis. "The Starving Ocean". Retrieved April 26, 2007. ^ Nova Scotia Business Inc. Defence, Security & Aerospace.Retrieved on: October 10, 2008. ^ Nova Scotia Business Inc. Defence, Security & Aerospace.Retrieved on: April 16, 2010. ^ Tourism Industry Association of Nova Scotia. Tourism Summit 2008. Retrieved on: October 10, 2008. ^ "Going Global, Staying Local: A Partnership Strategy for Export Development" (PDF). Government of Nova Scotia. Retrieved October 10, 2008. ^ Nova Scotia Business Inc. "Key Facts". Archived from the original on May 16, 2006. Retrieved April 16, 2010. ^ Trade Team Nova Scotia. "Information and Communications Technology". Archived from the original on July 6, 2011. Retrieved April 16, 2010. ^ Invest In Canada. 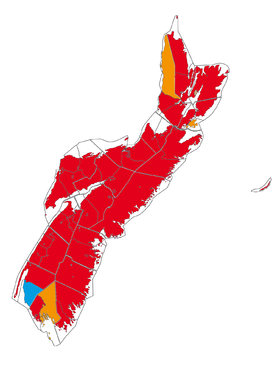 "Nova Scotia" (PDF). Archived from the original (PDF) on July 3, 2010. Retrieved April 16, 2010. ^ "Median total income, by family type, by province and territory". Statistics Canada. 2012. Retrieved September 11, 2014. ^ "Median total income, by family type, by census metropolitan area". Statistics Canada. 2012. Retrieved September 11, 2014. ^ Tower Software. "The Nova Scotian Economy". Archived from the original on May 31, 2010. Retrieved April 16, 2010. ^ Trade Team Nova Scotia. "Fisheries & Aquaculture". Archived from the original on June 6, 2009. Retrieved April 16, 2010. ^ Nova Scotia's Merchandise Trade with the World  Archived February 16, 2016, at the Wayback Machine. ^ Canadian Heritage (February 2009). Canadian Heritage Portfolio (PDF) (2nd ed.). Queen's Printer for Canada. pp. 3–4. ISBN 978-1-100-11529-0. Archived from the original (PDF) on June 11, 2011. Retrieved May 23, 2011. ^ Library of Parliament. "The Opposition in a Parliamentary System". Queen's Printer for Canada. Archived from the original on November 25, 2010. Retrieved May 23, 2011. ^ Dawson, R. MacGregor; Dawson, WF (1989). Ward, Norman (ed.). Democratic Government in Canada. University of Toronto Press. pp. 16–17, 59–60, 66. ISBN 978-0-8020-6703-6. ^ "RootsWeb: CAN-NS-GUYSBOROUGH-L JOHN WILSON, Sculptor, 1877–1954". Archiver.rootsweb.ancestry.com. Archived from the original on May 23, 2013. Retrieved July 6, 2012. ^ Sherman Hines Museum of Photography: Macaskill Collection Archived August 26, 2003, at the Wayback Machine. Shermanhinesphotographymuseum.com. Retrieved on July 12, 2013. ^ "The Emmylou Harris Story". Insurgentcountry.net. September 19, 1973. Retrieved December 13, 2011. ^ Ahern, Brian. "Brian Ahern – Credits". AllMusic. Retrieved July 6, 2012. ^ Cooke, Stephan (October 1, 2012). "Talented artist loved family, music". The Chronicle Herald. Halifax, Nova Scotia. Archived from the original on December 28, 2012. Retrieved December 28, 2012. ^ "Halifax Rainmen file for bankruptcy in 'disappointing' end". CBC. CBC. Retrieved July 15, 2015. ^ "2010 Nova Scotia Tourism Indicators" (PDF). Province of Nova Scotia. Archived from the original (PDF) on February 10, 2012. Retrieved December 26, 2011. ^ Pomegranate phone? Nova Scotia ad budget goes to cellphone concept video – latimes.com. Latimesblogs.latimes.com (October 30, 2008). Retrieved on 2014-04-12. ^ Government of Nova Scotia (1996). "Education Act". Retrieved April 26, 2007. ^ "Registered Colleges for 2010–2011". Province of Nova Scotia. 2010. Archived from the original on April 13, 2010. Retrieved July 26, 2010. For a more comprehensive list, see Bibliography of Nova Scotia. Griffiths, N.E.S. (2005). From Migrant to Acadian: A North American Border People, 1604-1755. McGill-Queen's University Press. ISBN 978-0-7735-2699-0. Murdoch, Beamish. History of Nova Scotia, Or Acadie. Vol 2. BiblioBazaar, LaVergne, TN, 1865. Wikimedia Commons has media related to Nova Scotia. Wikivoyage has a travel guide for Nova Scotia. "Nova Scotia" . Encyclopædia Britannica. 19 (11th ed.). 1911. pp. 830–832.